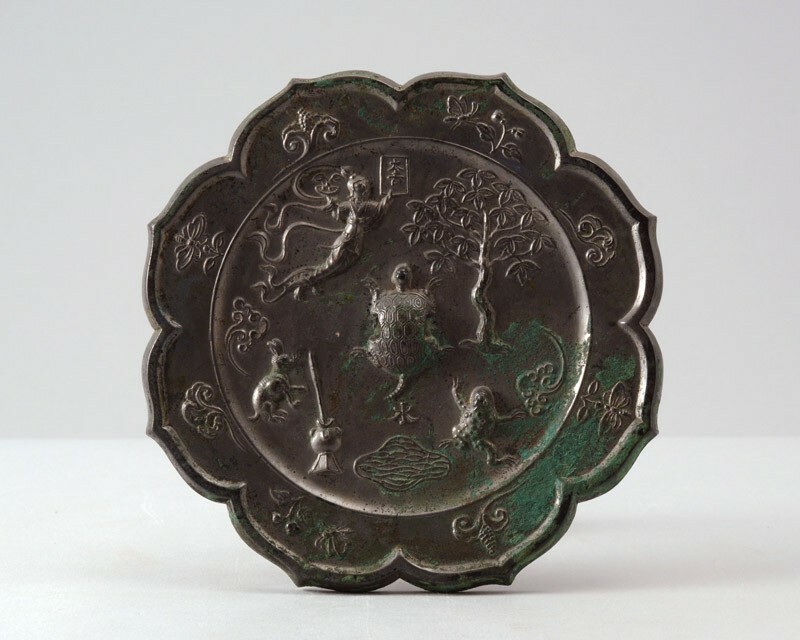 The decoration on this mirror represents wishes of long life; the various motifs are mostly connected with the moon. The female figure represents Chang E, the moon goddess, who is said to have stolen the elixir of immortality from her husband and to have fled with it to the moon. There she is believed to have been turned into a toad. The ‘jade hare’ is also said to live in the moon, where it grinds the herb of immortality, or else cassia twigs or bark, in his mortar. The cassia or cinnamon tree grows in the courtyard of the moon palace and symbolizes great age. The tortoise is equally representing longevity. The mirror is heavily cast, of barbed octafoil outline, with a slightly convex reflecting side and raised decoration on the reverse. A central pierced boss with a honeycomb pattern is shaped as a tortoise’s carapace, the animal’s small head, limbs and tail being represented in low relief. Surrounding the boss is a female figure floating in mid-air, dressed in loose robes with long fluttering scarves, her hair draped in a high chignon, her left hand holding a tablet inscribed da ji (‘great good fortune’), her right hand a potted plant, probably with a cassia twig; further, a hare below a cloud, next to an over-sized mortar and pestle; a stylized pond with the character shui (‘water’) above it; a toad, again below a cloud; and a cassia tree. The rim is decorated with four different insects approaching flowers alternating with cloud-like motifs. The piece has an overall silvery surface with patches of green patina.